I am going to give you a few pointers on how to organize your Raw and JPEG photos in your external had drives. Now remember this is my method of organizing my clients’ images in my hard drives. It may not work for you, but if you plan on taking your photo business to the next level it is key to have your images organized. If things start getting chaotic in your drives or computer, your business will hurt. TIP 1: When you first buy your hard drive make sure you buy it with enough memory to last you for one year. Remember you will be shooting lots of sessions, events and maybe video. I would play it safe and go for a 2TB Drive. 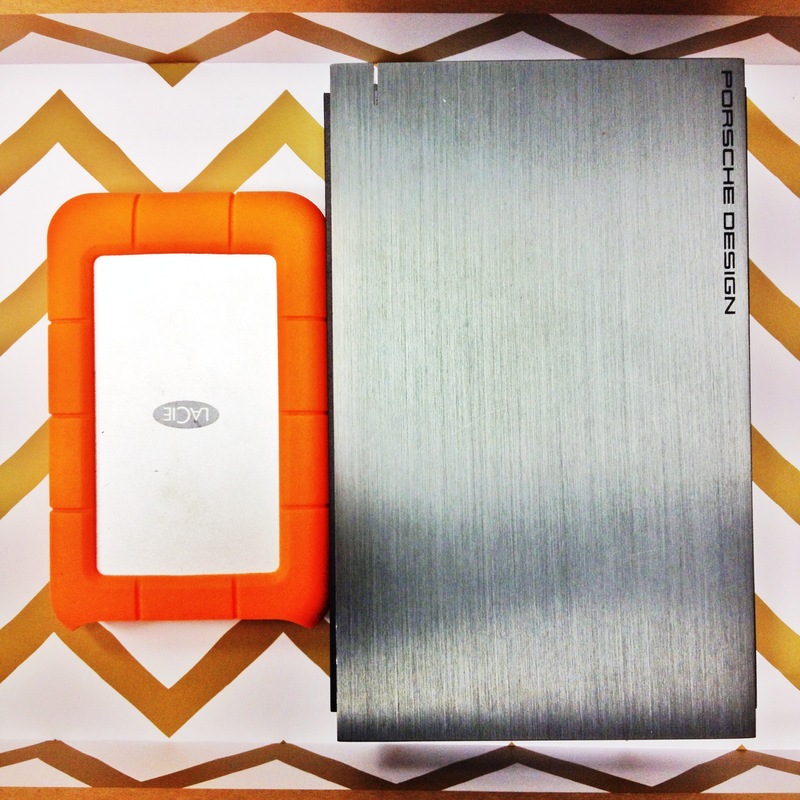 I personally like using Lacie drives and… I buy them refurbished from MacMall.com. Once you set up your drive on your computer do the following: create one folder and name it for the year you will be using it for. 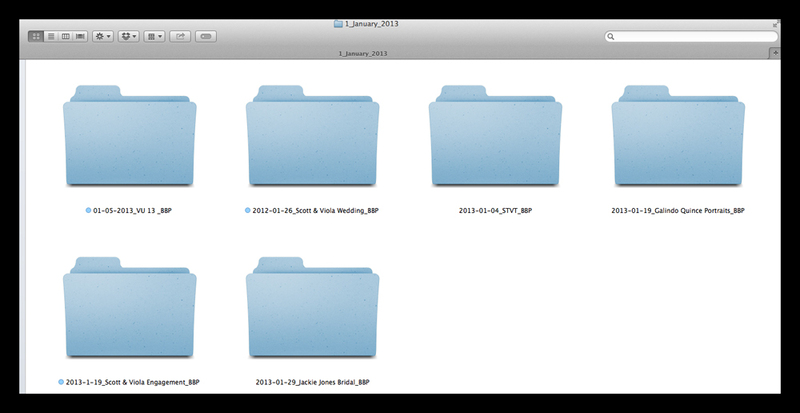 TIP 2: Within that folder you are going to want to create 12 new folders and name each one for the month in this manner: 1_January_2013. Naming them with the number first will automatically set them in chronological order. This will also help you look up events faster because you will be able to see the month, and find the folder you are looking for. It’s also very helpful if clients do not purchase their digital files from you upon signing, but do so later on. With this method, you’ll have them safely stored and well organized — which makes it a piece of cake to produce those digital files for them. TIP 3: Now that you have your folders setup by month you can began transferring in folders from your events and sessions. For my business I like to title the event folders in a particular manner: I put the the year first, then the month, the date and then the name of the event followed by the name or initials of my business, for example, 2013-01-20_Adam & Emily Wedding_BenBrionesStudios. This style of labeling helps me recall the exact date of the event plus the name of the client and what type of event it was. You may wonder, how is this super long name helpful? Well lets say your client’s parents contact you five months after the wedding and they’d like to purchase some prints or parent album. First of all you will not likely recognize them, so when they start asking you about their kid’s photos you can ask them, “What year and month was the event?” And with just the year and date alone you can narrow your search in seconds and get those orders started for your clients. Trust me this has happened before and it will happen to you. Earlier this month I had a client from 2012 call me asking for her daughter’s Quinceañera photos. I was able to access my 2012 drive and find them very easily. TIP 4: As I mentioned at the beginning, this is what works best for my business but it may benefit or inspire you as well. My last TIP for organizing your digital images on external drives is to divide the Raw or Original images into their own folder. The PRINT files are the high-resolution JPEGs and any behind the scene images you might have taken of yourself or your second shooters working. I like doing this because it keeps my Raw files all in one place, so if I ever need to go back and re-edit or look for a replacement photo I know where to look. I have had issues where a bride remembered I took three shots of her at a certain location. In the JPEG I gave her she didn’t like her smile that much, but recalled I taking others. So, to please my client I went back to my Raw files to find the outtakes of that. Other components were not good for production, but her smile was perfect. I was able to Photoshop the smile from the outtake on to the shot she liked. Ever since 2009, I have been posting behind the scene images of myself or my team working. Clients love it, they get to see us at work and other photographers get to see how we work. I always make it a point to take behind the scene images at a session or event — I make a folder for them and upload them to our Facebook page. The PRINT folder is where the final product is stored. I use the word, PRINT in the title so I know those are the high-resolution images that can be printed from sizes of 30×30 or less. This makes it easier for my clients to understand when they received them, because both the folder and the images have the same title and they know the photos are printable.